Originating in the Middle East, the Neolithic Age witnessed one of the most significant upheavals of civilization in human history: the transition from a culture of hunter-gatherers to an agricultural and sedentary lifestyle. During the Neolithic revolution, agricultural societies also began to spread toward Southeastern Europe. However, archeological digs show that the development of settlements temporarily declined about 7,600 years ago. Researchers from Frankfurt have now identified one of the likely causes for this. "Approximately 7,600 years ago, the sea level must have risen abruptly in the Mediterranean regions bordering Southeastern Europe. The northern Aegean, the Marmara Sea and the Black Sea recorded an increase of more than one meter. This led to the flooding of low-lying coastal areas that would have been ideal areas for settlement", says lead author Professor Dr. Jens Herrle of the German Senckenberg Biodiversity and Climate Research Centre and Goethe University. The new study is based on a sediment core from the ocean floor of the northern Aegean Sea, which allowed Herrle and his collaborators to reconstruct the level of salinity in this part of the Mediterranean between 11,000 and 5,000 years ago. The ocean floor is richly abundant in tiny fossils of the calcified algae species Emiliania huxleyi. 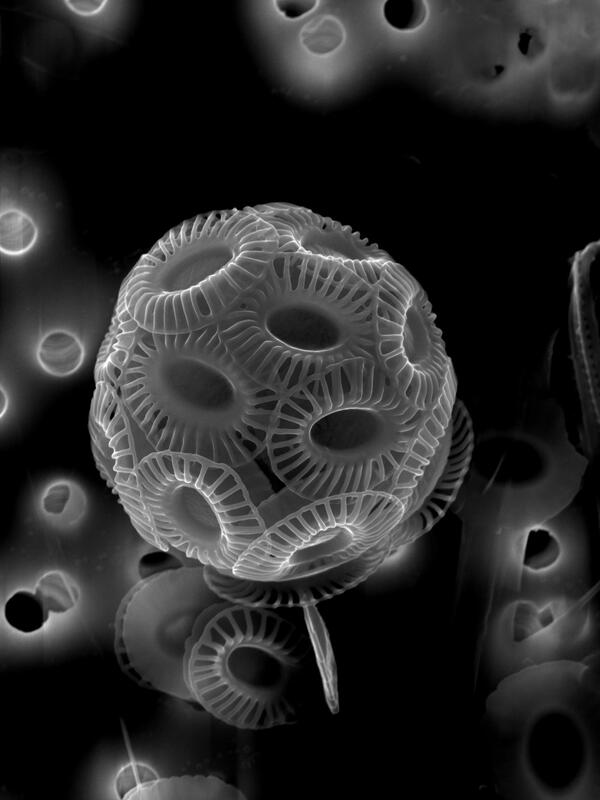 Viewed up-close under a scanning electron microscope, size changes in these algae preserved a signal of the level of salinity in the surface water of the Aegean during their lifetime. "These calcifying algae evidence two rapid decreases in the salt content, at approximately 8,400 and again 7,600 years ago, which can only be explained by the fact that a higher volume of low-saline surface water flowed from the Black Sea into the northern Aegean at these times. A prerequisite for this is a rapid rise in sea levels that would lead to an increased outflow of surface water in this direction. The source of this may have been Lake Agassiz in North America. This glacial meltwater lake was enclosed in ice and experienced a massive breach during this period, which emptied an enormous volume of water into the ocean," explains Herrle. The new evidence supports a conclusion of extensive flooding along the edges of the northeastern Mediterranean, coinciding with two standstills in the Neolithic revolution. The earlier change in sea-level approximately 8,400 years ago highlighted by the new salinity record coincides with archeological dates suggesting that settlement on low-lying areas had already been significantly impeded by rising sea levels and the subsequent climatic changes. The renewed rise in sea levels 800 years later likely further hampered the transition to agricultural communities. "Our results show that the timing and severity of past fluctuations in sea level has already had a significant effect on human history during its early agricultural development", explains Herrle in closing. "Due to climate change, we expect global sea levels to rise by up to one meter over the next 100 years. Millions of people could thus be displaced from coastal regions, with severe social and economic consequences." Goethe University is a research-oriented university in the European financial centre Frankfurt The university was founded in 1914 through private funding, primarily from Jewish sponsors, and has since produced pioneering achievements in the areas of social sciences, sociology and economics, medicine, quantum physics, brain research, and labour law. It gained a unique level of autonomy on 1 January 2008 by returning to its historic roots as a "foundation university". Today, it is among the top ten in external funding and among the top three largest universities in Germany, with three clusters of excellence in medicine, life sciences and the humanities. Together with the Technical University of Darmstadt and the University of Mainz, it acts as a partner of the inter-state strategic Rhine-Main University Alliance. Internet: http://www.uni-frankfurt.de. To study and understand nature with its limitless diversity of living creatures and to preserve and manage it in a sustainable fashion as the basis of life for future generations – this has been the goal of the Senckenberg Gesellschaft für Naturforschung (Senckenberg Nature Research Society) for 200 years. This integrative "geobiodiversity research" and the dissemination of research and science are among Senckenberg's main tasks. Three nature museums in Frankfurt, Görlitz and Dresden display the diversity of life and the earth's development over millions of years. The Senckenberg Nature Research Society is a member of the Leibniz Association. The Senckenberg Nature Museum in Frankfurt am Main is supported by the City of Frankfurt am Main as well as numerous other partners. Additional information can be found at http://www.senckenberg.de.